I'm going to have to insist you see it. It has the weight of a Holocaust movie. But then it would do because it's about people being sent somewhere against their will, and come the end of it they don't even know who they are anymore. And it's all true. It's about the children who were deported from England to Australia from the end of the war up until as recent as 1970. They didn't want to go. They didn't get a choice. Apparently 130,000 children were deported from the UK. Can you believe that? "you feel for us, 'cause we can't." This is a story about identity. About being taken to another country and being made to work as a slave. To have one piece of clothing for your entire childhood as you work as a labourer. The English have blood on their hands. So do Australians. So does the Church. We're good at hiding this stuff. It's directed by Jim Loach. You can't write about him without mentioning he's Ken Loach's son. But it's not important. This is Jim's film. He spent eight years working on it and developing it with screenwriter Rona Monro, and with Margaret Humphreys, who it's based on. This film is why Emily Watson became an actor. She's never been better than in 'Oranges & Sunshine.' Not that she's ever been bad. Here she's at career best. You care for her because you care for her character, but also because she reminds you of you. So do the orphans as they try to face up to their history, try to face up to not knowing who their Mother's are. You relate to it because of how human they are. Some are broken hearted and weak, some put up huge walls and refuse to be emotional. It's just like me and you. 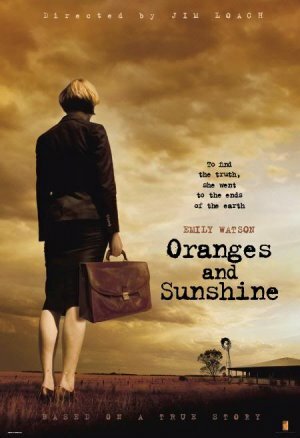 'Oranges & Sunshine' is gritty. Not in the graffiti-filled-council-estates kind of way, but in that it gets down to the nuts and bolts of life and corruption. The church was involved, the children's charities were involved, the governments were involved. This is why film is important. It teaches us what we don't know and it reminds us of what we do know. It's a mirror for our best and worst. A lot of stories need to be told, but they get told badly and the meaning is lost. Not this one. It'll get you. It makes people cry and it makes people think and it makes people talk. That's what we want independent films to do. The film comes out in the UK in April and in the USA some time after. Hopefully the film will get distribution in other territories too. We'll see in they do a deal in Berlin. The world needs to see this film. Keep it on your radar. I only remember Emily Watson in one film (even though I know she's made a good reputation from plenty), and that is the biopic, "Hilary and Jackie." Her performance was outstanding, and seeing her name in the film is a definite plus. I'm glad you wrote a film review, because I would never have heard of the movie, seeing as how I don't watch TV and really go on two websites. Lachrymose stories about a dreadful and forgotten history is very much needed. On the side note, I like your film reviews. They're very aesthetically appealing, in terms of your writing (your writing is always good anyway). You're succinct, but you're not too brief, which a lot of other critics have the fault of sounding a little detached when they do so. "We're good at hiding this stuff." I will see this one for sure. For me, such a timely post. Where I live, we have our own very-neatly-tucked-away-years-ago secret story that involves the church. There's barely anyone left alive whom I can interview for information. I've been trying to figure out how to write about it, and whether it's even important enough to write. Your post reminds me that it may be worth telling. After reading this post I really want to see this film (please remind me of it when it comes out). I like the way you write about films, with such passion and enthusiasm, wonderful! I'm sorry for not commenting that often (well it wouldn't be interesting either), but do you have a link to the story behind the film? Hi there, firstly MartininBroda this might be a good starting point as a link http://en.wikipedia.org/wiki/Margaret_Humphreys. I found your review of this film very encouraging as I enjoy films that do not shy away from difficult subjects. It sounds like this film will be very illuminating and powerful. LEILA - Thanks so much for the compliment! JAYNE - I'd love to know more about what you're working on. Maybe I can suggest ways for you to get the info you need! MARTIN - Happy Frog covered it really--- start with Margaret on Wikipedia; have a good read up about her! Fascinating. HAPPY FROG - The film is VERY powerful, which is VERY rare! I hope you get to see it soon. BEVERLY - I agree with what you say. We need more films like this. That delve deeply into important truths.